Born in the Philipines and currently residing in Brooklyn, Francis Estrada is a visual artist, museum educator at the Museum of Modern Art, and freelance educator of Filipino art and culture. Francis has a fine arts degree in painting and drawing from San Jose State University, and he has taught in a variety of studio, classroom, and museum settings to diverse audiences, including programs for adults with disabilities, cultural institutions, and after-school programs. He was also an administrator and educator at the Museum for African Art, where he enjoyed teaching about the amalgamation of art and culture through objects. Francis exhibits his work nationally, including online publications. His work focuses on culture, history, and perception. I investigate relationships between characters and their environment. 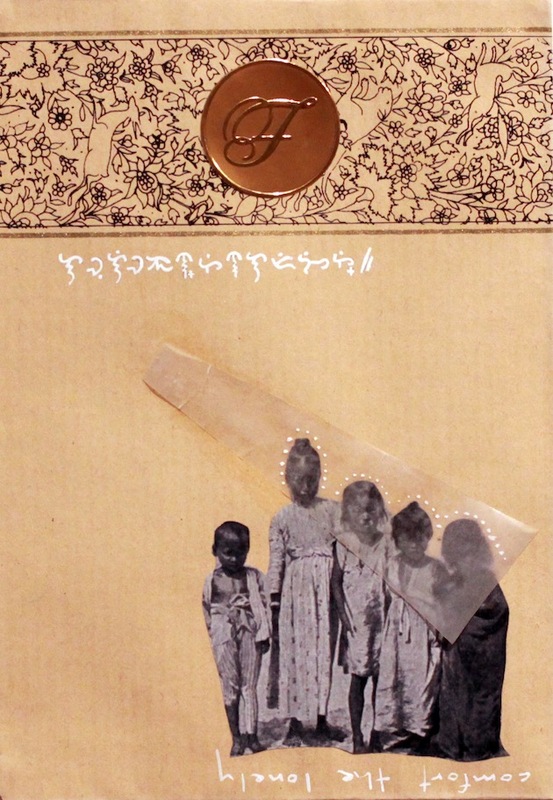 I incorporate pieces of personal, historic and/or ethnographic photographs, text, and motifs (most of which broach the combined themes of history, sentimentality, and nostalgia). Using some or all of these pieces, I compose scenarios with which I find personal connections then arrange them without providing a complete image or narrative. By de-contextualizing visual images (figures, symbols, motifs) from their original source, I attempt to create an ambiguous space for the viewer to complete. I interrogate how context is created through combinations of these visual elements. How does the viewer identify with the images presented, and does the composition create a narrative? How do the combinations of images create notions of space, place, history, identity, or memory? By creating drawings that assimilate text, photographic reproductions, and symbols, I provide the viewer with a space in which they can decipher the visual clues and “complete” the work. My art is a tool through which I confront how our understandings of culture are mediated, and the methods through which history and memory are created and perpetuated. I think of my work as "partial portraits" that are activated by the viewer. I believe that my work speaks to the theme of Storm: A Typhoon Haiyan Recovery Project by connecting to how the media represented the country through images from the aftermath of the storm. Also, various fundraising events brought out a vast array of artists and performers who used their talent to share Filipino customs (dance, song, martial arts). Between the media and these events, people were able to see and experience various aspects of Filipino culture. I feel that my drawings similarly portray various aspects of Philippine culture through the images that I choose to show.